A Mid-Year Look at the Washington DC Area Housing Market: What is the Outlook for Moderate-Income Homebuyers? Despite a rise in home sales and inventories in June, in 2015 the Washington DC area housing market has been characterized by relatively slow sales activity and price growth. After strong price appreciation in the housing market in 2012 through 2014, upward pressure on prices has eased in many markets across the region. Despite this slowdown in home price growth, however, the availability of homes that are affordable to moderate-income households remains limited. The high end of the market continues to be strong, while the inventory of more modestly priced housing remains far below demand. The only affordable options in many localities are condominiums which are often too small or otherwise unsuitable for families. Without an increase in the supply of more moderately-priced homes—including not only condominiums but also smaller single-family homes and townhouses—homeownership may continue to be out of reach for many would-be first-time homebuyers in the region. 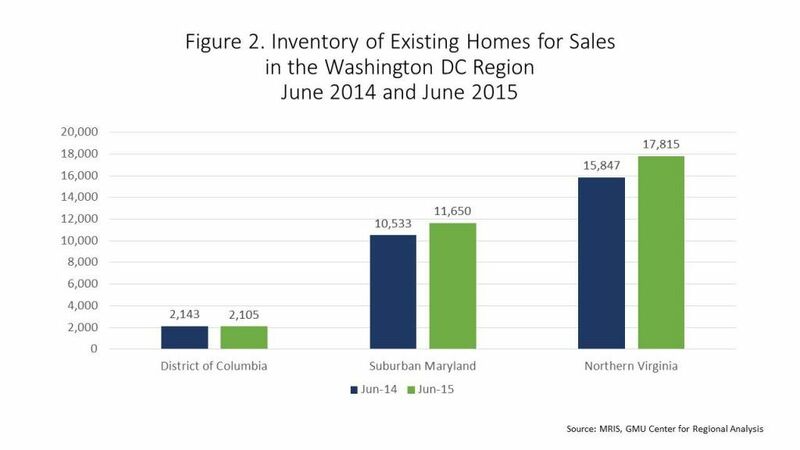 According to the most recent data from MRIS, the region’s multiple listing service, sales activity was strong in the Washington DC region in June. In fact, the 8,901 sales posted in June was the highest total monthly sales figure since December 2005 and a 16 percent increase over the number of sales in June 2014. 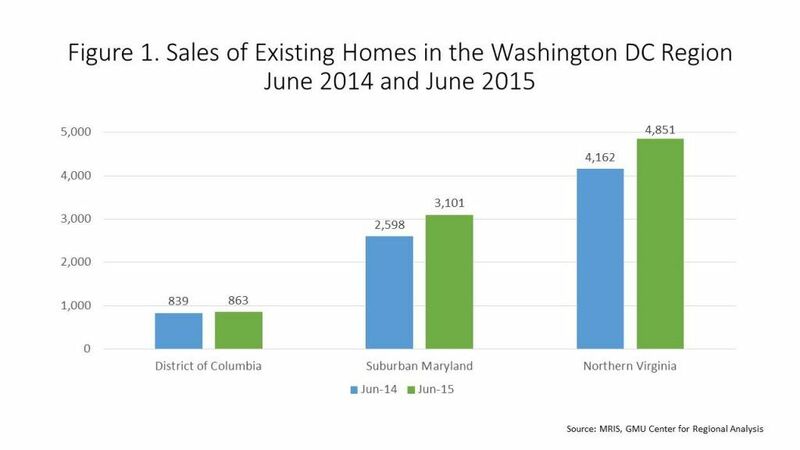 Sales were up fastest in Suburban Maryland, where there were 3,101 sales in June, reflecting a 19 percent increase compared to a year ago. The number of sales was also up in the District of Columbia and in most jurisdictions in Northern Virginia. The strong sales activity is indicative of the current demand in the region which has been stymied by constraints on access to credit and low inventories in recent years. 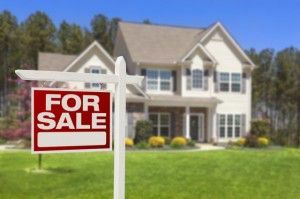 The total inventory of homes for sale in the region was also up in June compared to a year earlier, although the rise in inventory levels was outpaced by the increase in sales regionwide. In June 2015, there was a total of 3,093 homes listed for sale, up 11 percent from the June 2014 inventory. Inventories were up in the suburbs but down slightly in the District. For the region as whole, there were about 3.6 listings for each home sold in June, which is a relatively low listings-to-sold ratio and is further evidence of the continued strong demand in the region. While sales and inventories were up, prices were actually down in June. 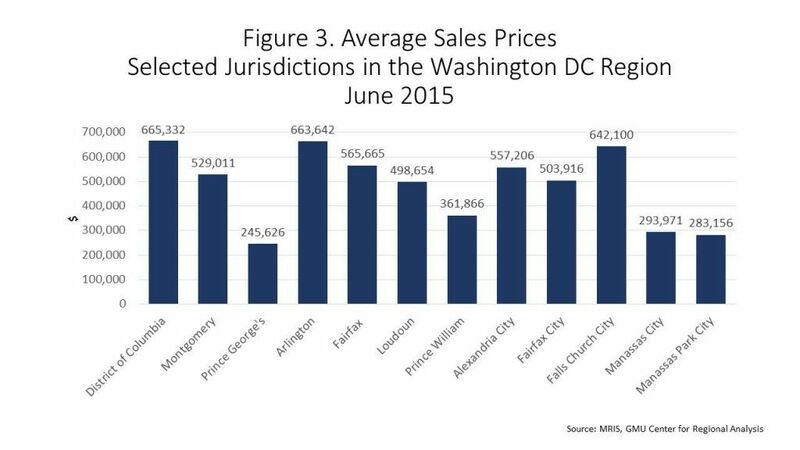 The average sale price in the Washington DC metro area was $468,252 in June 2015, down a little over a percent from a year ago. Prices were down by about two percent in the District and one percent in Suburban Maryland, while the average sale price in Northern Virginia was virtually unchanged between June 2014 and June 2015. The highest average home prices were in the closer-in jurisdictions, including the District of Columbia, Arlington, Fairfax County and the city of Alexandria. The lowest home prices tended to be in the more distant suburbs as well as in Prince George’s County. Despite the slowdown in price growth in 2015, high prices in the region have made homeownership a challenge for many working households. In an analysis of homeownership opportunities for workers in the Washington DC area, NHC’s Paycheck to Paycheck found that many workers—including nurses, software programmers, teachers, fire fighters, and administrative assistants—do not earn enough to afford the median priced home in the Washington DC region. suburbs tend to be more affordable, prices continue to rise. In Loudoun County, for example, the average condominium sold for nearly $300,000 in June 2015, up over four percent from a year ago. There are opportunities for moderate-income buyers in the condominium market. 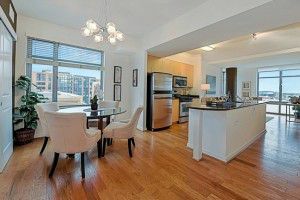 Over 60 percent of condominiums listed for sale in Arlington County, 72 percent of condominiums for sale in the city of Alexandria and about 85 percent of the condominiums for sale in Montgomery County are priced below $400,000, for example. 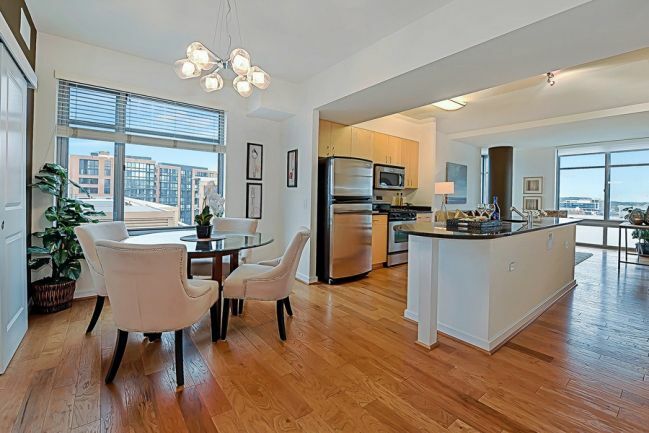 Condos are relatively pricier in the District where only 48 percent of all condo listings are below $400,000. However, many of the condos priced below $400,000 are studio or one bedroom units, which are not suitable for families. New construction is not adding to the affordable supply fast enough. 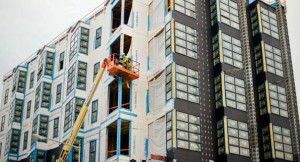 For example, according to the website Urban Turf, there are currently 11 condominium projects in the District of Columbia that are under construction and actively selling. Several of the new projects include affordable units, including the 1115 H Street project which made use of publicly-owned land to help subsidize the cost of providing affordable units, and the Maryland, on Maryland Avenue NE, there are simply not enough units being developed with prices that are affordable to households earning below the area median income. Single-family homes are out of reach for all but the highest income households in the closer-in jurisdictions. In recent months, nearly one in five homes sold in the District was priced at over one million dollars. Data from MRIS show that nearly one quarter of the active listings in Montgomery County have list prices of $800,000 or more. And there are only nine single-family homes for sale (included townhouses and duplexes) in the city of Alexandria with prices below $400,000, less than four percent of the inventory of single-family homes in the city. In Arlington, there are only seven listings of single-family homes priced below $400,000, accounting for just two percent of the listings. Nationally, as homebuilder confidence rises, new home construction is rebounding but average home sizes are increasing, indicating that an important part of the homebuying market is still not being adequately served. First-time homebuyers have been a growing part of the housing market nationally. But the opportunities in the high-cost Washington DC region are limited. For individuals and families with moderate incomes, it is a daunting task to try to find an affordable home to buy. The problem is most acute in the closer-in jurisdictions. Moderate-income families, in particular, face very few options for homeownership in areas near jobs and well-served by transit. Some conditions have improved for first-time and moderate-income homebuyers. The mortgage market is opening up access to credit (although some see this loosening as potentially problematic) and interest rates remain low (although with the Fed set to raise rates later this year, mortgage rates will rise soon after). A big part of the strategy for increasing homeownership opportunities is to increase the supply of more modestly-priced homes. Localities need to allow for the development of more smaller homes, including condominiums and smaller single-family and townhomes on small lots. Changes to zoning requirements can help facilitate the development of smaller, more affordable homes. 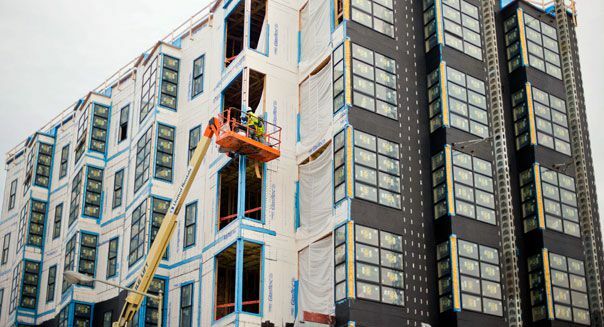 Innovative zoning techniques, including transfer of development rights, reduced parking requirements, and allowing more townhouse and multi-family development by right, can create opportunities for and reduce the costs associated with affordable housing development. Shared equity programs represent another strategy to open up homeownership opportunities to moderate-income households. The biggest challenge is how to make homes available that can accommodate not only the single Millennial first-time homebuyer, but also the Millennial—and others—with growing families. Check out Rev. Jon Smoot’s commentary on what Habitat for Humanity of Northern Virginia is doing in Alexandria to bolster affordable homeownership opportunities. As a provider of homeownership opportunities for lower-income families, we at Habitat for Humanity of Northern Virginia see first-hand the benefits of owning an affordable home. It is a key element in breaking the cycle of poverty. As a stable form of housing, homeownership is associated with better outcomes for families. Homeowners’ children tend to perform better in school and display fewer behavioral problems. It also provides a way for the family to build wealth. Beyond the benefits to lower-income families, homeownership contributes to communities; our homeowners pay property taxes and take pride in their properties. Homeownership also induces higher civic and volunteer participation, and lessens dependency on government subsidies. By building or rehabilitating 92 affordable single-family and multi-family homes, and repairing 33 homes, we have improved the lives of more than 425 people in Northern Virginia. We keep our homes affordable by reducing our development costs through volunteer labor, and donated professional services and materials whenever possible. As a non-profit, we are also able to offer zero-percent interest mortgages with very low down payments, making homeownership available to lower-income families with good credit and steady income who can’t qualify for conventional home loans. In our 25 years of providing a “hand up” to homeownership, we have never foreclosed on a partner family. Our model to put a mortgage within reach of well-qualified, first-time homebuyers transforms lives and neighborhoods.